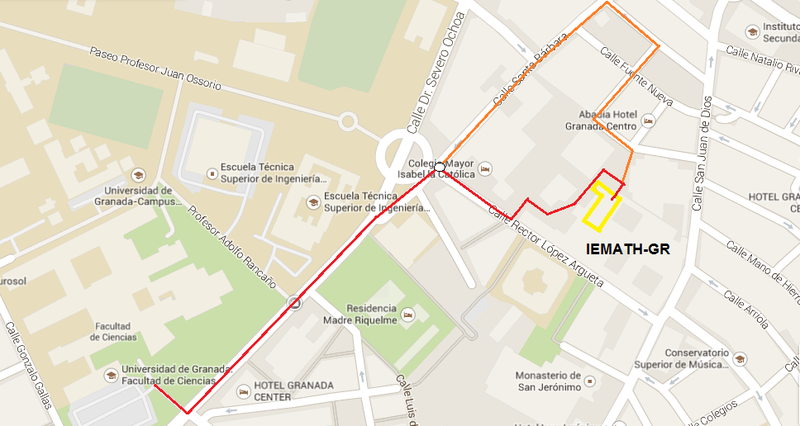 The IEMath-GR’s address is at Ventanilla nº 11 de Granada, are its facilities follow the agreement CSIC-UGR of 25-04-2011. By Rector López-Argüeta street. Follow the red path in the picture below. By Ventanilla street. Once arrived to the white spot, follow the orange path. This access is temporarily closed. 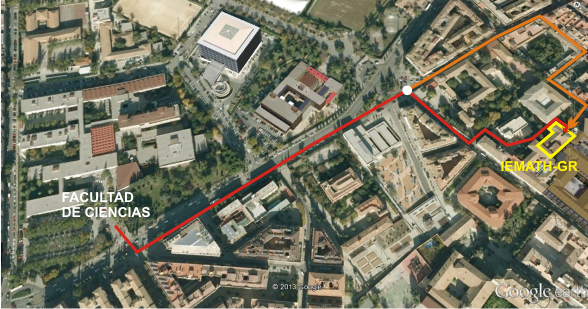 The distance between the Faculty of Sciences and IEMath-GR is about 700m (10 min walking). The usual entrance to IEMath-GR is through Rector López-Argüeta street (by the parking of the Centro de Documentación Científica). This entrance has a door separating the IEmath-GR from the area of the Centro de Documentación Científica, equipped with an electronic card reader (see below). The main entrace to the IEMath-GR’s building has another card reader of the same type. 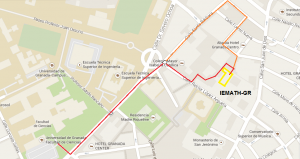 Except for special occassions, the access by Ventanilla street is closed. For UGR members, the electronic card is the tarjeta universitaria (TUI)(permanent validity). To apply for a TUI, ee instructions here. Once you have the TUI, it must be configured to open the two electronic locks that you will encounter when trying to access the IEMath-GR. To do this, please send an email asking for this configuration together with your name, NIF and Department to Sonia-Chantal Gil González (Responsable negociado Departamento de Algebra): soniagil(at)ugr.es. Fill this form (three copies, already contained in the previous pdf file). In this form, be sure to include the email address of the visitor in the field “Datos de contacto”. Also, the data in the fields “Datos de la persona responsable de la UGR que da el Visto Bueno a la solicitud” and the corresponding signature in the left square refer to the head of the Department of the host researcher, or to the Director of the institute. The visitor will only sign in the center square. The right square should contain the expected ending date of the visit, in the field “Fecha CAD”, but no signature will be included and the field “NI tarjeta” will be left blank. Deliver the three copies of the form at the Secretaría del Departamento de Álgebra (office 34 – 2nd floor of the Mathematics building, Sciences Faculty), together with a copy of the DNI or passport of the visitor. In this case, the host researcher will provide contact data to the secreatary (staff) of the Department of Algebra, Sonia-Chantal Gil González. Alternatively, this step can be done by sending an email with scanned versions of the three copies of the form and the DNI or passport to soniagil@ugr.es; in this last case, the body of the message will contain the contact data of the host researcher. Once the temporary card has been activated, host and guest researchers will receive an email to make them know that the card is ready to be collected by the visitor at the Secretaría del Departamento de Álgebra. When collecting the card, the visitor will sign in the right square of the form. At the end of the stay, either the visitor or the host researcher will give the card back at the Secretaría del Departamento de Álgebra. WARNING: Applying for a visitor card in advance will let the visitor use the card from the first day of his/her stay. By default, temporary cards only include access to the building (side door and main entrance). If the office assigned to a visitor has an electronic locker, access to it can be added to the card. To do this, simply send an email to iemath@ugr.es with the data: number of the temporary card, visitor’s name, assigned office and period of the stay. From Granada airport. The airport is 17 km from downtown. Correspondences between Granada and its airport can be done by taxi or bus. The cab fare is about 27€. There is a 3€ bus airport-downtown, whose sixth stop is at “Jardines del Triunfo”, from where both the Sciences Faculty and the Math Institute are just at 10 min of walking distance. From Malaga airport. 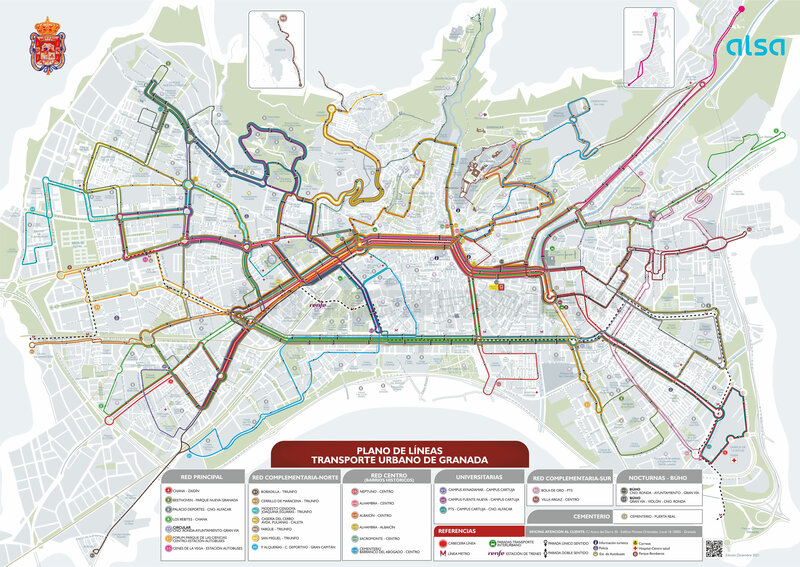 The bus company Alsa has a service connecting directly the airport of Malaga with the city of Granada. From this airport, the daily departures of the bus are at 11:30 y 18:30. For more information, please visit Alsa website. Another available connection is through the bus station in Malaga, from where one can find buses leaving to Granada each hour. These buses arrive at the bus station in Granada, from where one can take a taxi to downtown (about 10€) or a urban bus (lines SN2 or SN5) in order to arrive to the Sciences Faculty or IEMath-GR (see here for a map of the urban buses in Granada).